Bruce died almost a month ago. Peacefully, at age 86, surrounded by his children, as one would want. Much like my dad, he died with no trouble or fuss to anyone. He decided it was time, quit eating, and called his children to come. Hospice came in two days before he passed. The night before he died, he awoke at 3 am and chatted through the night with his son, Chad, even going through some math problems. Bruce was a technical guy, and loved math problems. It’s hard to overestimate how important he was to us. Not just to me, to us, our community of Toastmasters. He belonged to so many clubs – it was impossible to determine how many. Toastmasters was his social life, his true calling. He welcomed and drew people in and helped them take their first shaky steps into public speaking. He encouraged and called, or more often wrote. He wrote notes and letters and cards. I have a whole file folder full, and I only kept maybe a third of them. You know that phrase “covered in glory”? That’s what it felt like to be loved by Bruce. He covered me in glory. He praised me endlessly and acted like I was a goddess sprung from a clamshell. He was effusive, concerned, honest. He took my petty offerings with such open-hearted enthusiasm, like the time I gave him a book of poetry the girls in a writing mentorship program had written, and he stayed awake all night reading it. He reported back that it had given him new courage and enthusiasm to write poetry himself. This was a man in his 80s, unabashedly diving into writing poetry, cheered by the bravery of teenaged girls to put pen to paper. About six months before he died, he began telling us all, his friends, that he loved us. He said he had decided that he didn’t want to leave this world without us knowing that. So at every parting, we said “I love you.” We said it often. God, I miss him so much. At his memorial the other day, we sang “What a Wonderful World,” together. I think it was a perfect tribute, because if everyone behaved like Bruce, what a wonderful world it would be. 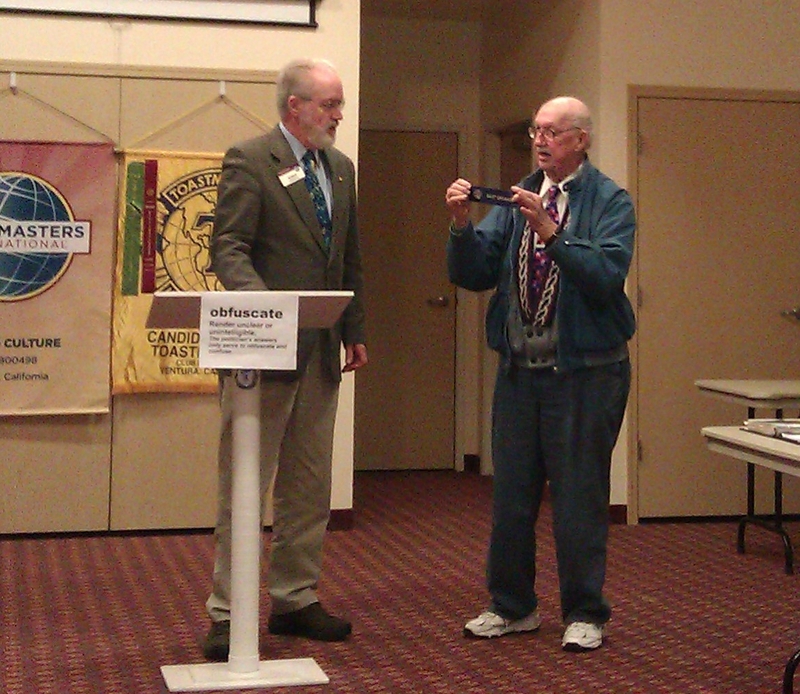 Bruce, on the right, doing what he loved most – goofing around at a Toastmasters meeting. Sometimes I am amazed by the people we are blessed to call friends and loved ones. He left this world knowing he was loved too. Love and hugs to you. We had two memorials for him, and there was plenty of laughter and tears at both. Who could ask for anything more? Thanks for sharing his story. He sounds like one of the best kinds of friends. Yes. I miss him so much. What a wonderful tribute. It makes me wish I’d known him. He was one of a kind, a true gentleman.